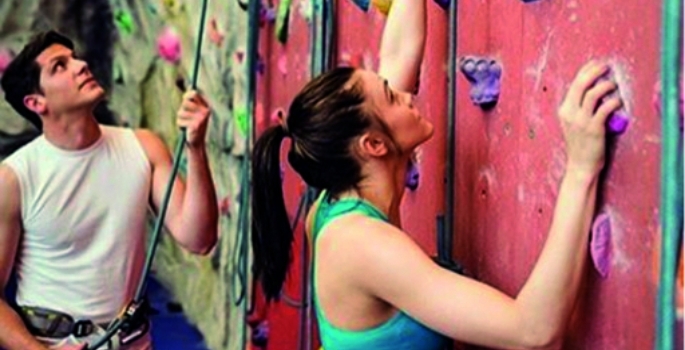 The development of sports and wellbeing programmes throughout UK universities is a very popular investment this year. From programmes focusing on inclusivity, to targeted mental health and exercise initiatives, physical and mental health are two of the top talking points in HE. And it’s easy to see why. A recent report from Newcastle University and the University of Strathclyde reported that physical activity often starts to rapidly decline in children from the age of seven, leading to poor activity habits and health problems later on in life, and the HSE report for 2014 showed that adult obesity levels have risen from 15% in 1993 to 26% in 2014. A severe lack of physical activity is also detrimental to our mental health, and the Adult Psychiatric Morbidity Study for 2014 showed that nearly half (43.4%) of adults in the UK think that they have had a diagnosable mental health condition at some point in their lives. With these kinds of figures of physical and mental ill health, it comes as no surprise that educational institutions are investing heavily in addressing these issues. 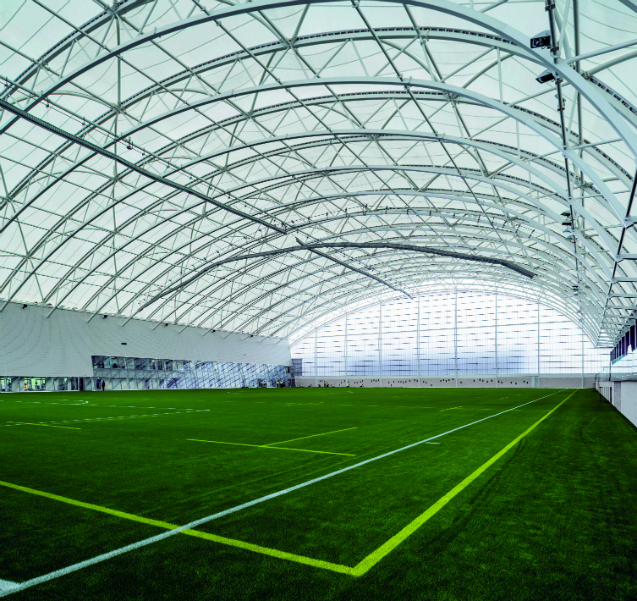 Oriam includes the largest indoor synthetic pitch in the northern hemisphere, as well as a new sports hall, fitness centre, and state-of-the-art performance facilities, including strength and conditioning and hydrotherapy spaces. The light and open spaces of the new Oriam centre were designed to offer an inspirational and enjoyable experience for all visitors. A clear plan and high levels of visibility were key in the design from the project team, which included architects Reaich and Hall, and were incorporated into the two existing features: an original Victorian brick wall, and a protected pinetum. The new facilities at Heriot-Watt have improved the overall reception of sport in the area, and Craig Leamy, Vice President of Heriot-Watt’s Basketball Club commented, “Oriam’s facilities allow various Sports Union Club matches to be held at the same time making for some great spectating opportunities. Spectator numbers have increased as a result as well as inter-club support.” This focus on all parts of the sporting experience is sure to address both physical and mental health concerns in the UK. In August 2016, YouGov reported that one in four students experience some kind of mental health problem, and as such, the importance of facilities that encourage both healthy lifestyles and enjoyment are of utmost importance. As well as the plans to expand the indoor facilities, Newcastle University also have a plan in place to regenerate their outdoor facilities, opening the new and improved Cochrane Park facilities in time for the start of the 2018/19 academic year, preceding the indoor counterpart by a year. The aim at Newcastle is to cater for all abilities, from complete novices, through to students that are a part of Team Newcastle, as well as other performance-standard athletes. Like Heriot-Watt’s Oriam facility, many new developments across the UK HE sector are not only for the use of university students, but are also open to the general public. One such facility is the newly opened £55m Sport and Fitness Club at Birmingham University. Opening on 22nd May this year, the facility is aimed at both university students, and the local community of Birmingham. 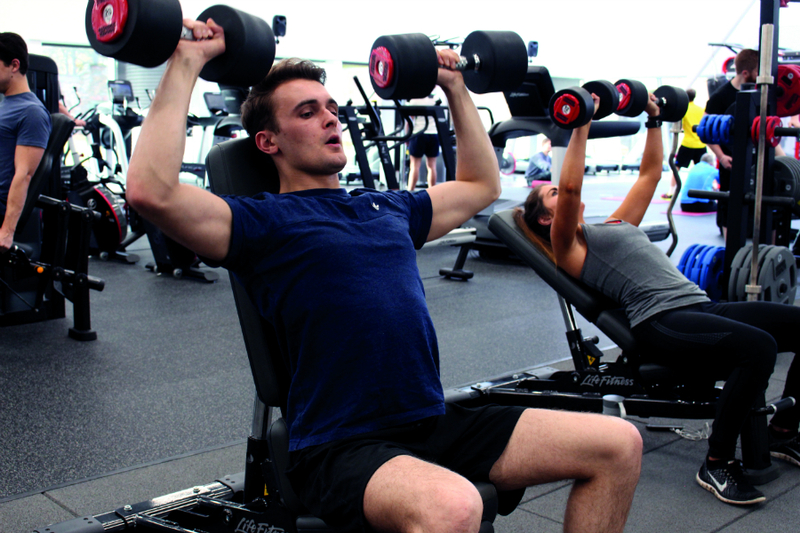 The University aim to encourage both students and locals to engage in physical activity, whether they are of a performance standard, or whether they are complete beginners. Encompassing an array of facilities, including Birmingham’s first 50m swimming pool, the development includes a large multi-sports arena, six glass-backed squash courts, a 10m climbing wall, and five activity studios. The gym, which has almost 200 pieces of equipment and an open training space, has been named ‘Chrissie’s Gym’, after a public vote was held to determine an honouree. The winner was Birmingham University alumna and four-time Ironman Triathlon World Champion, Chrissie Wellington OBE, who has subsequently lent her name to the new facilities. The development was designed with the highest possible specifications of environmental sustainability and accessibility in mind. Materials were sourced from around the world, and the new swimming pool includes a platform lift for accessible entry. The cumulative infrastructure that these sporting facilities support is the larger contribution, here. It is not only the sports clubs and athletic competitions of the students that are being addressed, but also the general wellbeing of the university, and of the wider community. With the NHS warning that living with obesity can cause depression, as well as a myriad of other health problems, the need for improving the health habits of the nation as a whole have many more widespread implications than physical ailments. Similarly, poor mental health can be exacerbated by lack of exercise, which in turn makes exercise even more unlikely. Providing a healthy and enjoyable outlet for both students and the public means that universities and their surrounding areas are more likely to flourish, and to pass this wellbeing forward. With this in mind, it is unsurprising that universities across the country are so keen to improve their offerings, and long may it continue. Three years on, the University of Kent’s first-class tennis and netball facility continues to deliver in function and possibility. Designed and manufactured by national sports facility specialists Collinson, day-to-day management of the facility falls to Kent Sport, who are making the most of all the multi-use indoor space offers, hosting activities like softball cricket and indoor archery between tennis matches and netball games. Both the University and Kent Sport had refused to let the relentless wet weather of previous years prevent them from providing a comprehensive sport experience, from recreational to the elite. The clear solution? A dedicated indoor facility. To offer the best to students and members, the facility would need to be economical without compromising on quality. Being based at the University, it also needed to be versatile enough to accommodate other sports, particularly during exam season, when main halls would be out of action. After research showed the economic benefits, such as reduced construction costs and shortened build time, Kent Sport opted for a clear span, tensile membrane structure to house their two-court build. Then, it was time to contact manufacturers. Enter: Collinson and the Challenger™ facility. For Kent Sport, Collinson was the clear winner when it came to design and delivery of quality sports facilities. The Challenger building system constitutes a clear span, steel superstructure which requires minimal foundations and can quickly be erected. Renowned for its efficiency, the system sports a tensioned PVC membrane covering which allows light to permeate the building and bathe the courts in natural light, for that outdoor sport experience, indoors. So light is the facility that the artificial lighting goes mostly unused during the summer months, great for whole life costs. Opportunities for customisation meant Kent Sport were able to choose exterior colours, opting for a striking colour block effect that incorporated both the Kent Sport and University logos. Lee Thompson, Kent Sport outdoor facilities manager, said the centre has “given more scope to be able to do many sports indoors”, confirming the development was “really positive” in both impact and reception. Did Kent Sport serve an ace? Absolutely, and with the help of the Challenger™, they’re going from strength to strength.